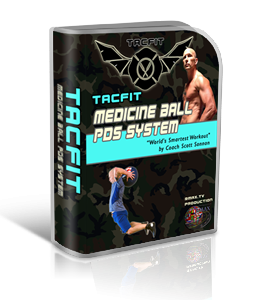 TACFIT Medicine Ball PDS System is a movement based medicine ball training program. Using applied biomechanics and stress physiology, Scott Sonnon modified existing medicine ball training research and equipment through two methods - Elastic Explosiveness and Core Activation - to create an injury-free approach to the modality, but moreover, the most effective method to train with medicine balls and achieve sustainable results. 3 levels of Progression promise make this program perfect for all skill levels. A Start-up Guide, 6 Daily Journal Calendars, and a wealth of instructional and follow along videos will guide you through the Medball PDS program and ensure you get the most from your training.